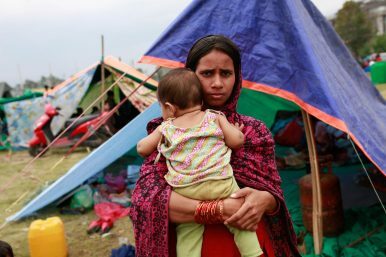 Three days after the earthquake, a mother holds her baby outside a tent in an informal camp, in a field next to Nepal Army headquarters in Kathmandu. The deadly earthquake that tore through Nepal on April 25, 2015 killed over 9,000 people and destroyed more than 700,000 homes. Devastating images of villagers standing amid a sea of rubble that was once their homes quickly prompted the international community to respond and donors pledged billions in aid. But two years of political turmoil and debate over a new constitution have massively hampered reconstruction efforts. The majority of families living outside of Kathmandu, the capital, have been left to endure the harsh winters and brutal monsoon seasons with nothing more than tents or makeshift shelters. Many have given up hope that help will ever come. But for some, their only hope lies with the children they sent to Kathmandu, believing they would attain the kind of education and work that a rural villager could only dream of. One day, most were told, their children would return to their villages educated and with high paid jobs, having become doctors or lawyers. They would return and help their families live a better life and they would make the poverty they grew up with a distant memory. In reality those desperate families, some of the poorest in the world, will probably never see those children again. They may also never know that the man they handed their children to, along with all of their personal wealth, was in fact part of an industry that thrives on the exploitation and trafficking of children. Some of those children will be trafficked out of the country and sold into slave labor in places such as the Middle East and India. Others will either live out their childhoods in Kathmandu’s tourist district of Thamel, locked in massage parlors and “entertainment” venues, or suffer malnutrition and abuse in the confines of an illegal orphanage designed to manipulate travelers. A lucky few will be given a home in a legitimate orphanage where they will be cared for as orphans and receive a basic education, but like all the others they will never lay eyes on their families again. The war lasted from 1996 until 2006 and pitted the Maoist-led People’s Liberation Army (PLA) against the Nepalese monarchy. People saw it as a chance to fight back against decades of discrimination and inequality, inspired by the idea of communism and by the Chinese leader Mao Zedong, who often spoke of equality within China. The insurgency was centered primarily in small rural villages, leaving the poorest people in the country to face the brunt of human rights violations committed by government forces or crimes committed by Maoists. One of the most damaging policies enacted by the rebel army was the “one family, one child” program, which meant each family had to provide one recruit and if they didn’t they would face severe punishment. Families were terrified for the safety of their children and desperately tried to protect them from being forced to fight. That desperation was seen as a business opportunity by those willing to exploit it. A person, often with political connections or some standing in the community, would enter the villages and meet with families. They would offer to take their children away. They would tell the families that the children would be taken to boarding schools, taught to read and write and be fed and cared for and most importantly, they would be safe from the war. It was too good to be true but families across the country were soon selling their homes, their land and their livestock. They would even borrow money from distant relatives or commit themselves to a lifetime of debt and hand every penny over, along with their children. Scott Rosefield, former communications director of the children’s charity Umbrella Foundation, based in Kathmandu, said this was when the floodgates for trafficking opened. “Parents were very frightened and if they had a son, especially a young man, then they were being pulled by the Maoists one way and the Army in the other,” Rosefield said. “It was very easy for someone to say it’s not safe here in the village but in Kathmandu there is no war. I can get your child to a safe place so you don’t have to worry about him being conscripted by any side. By the time the war came to an end, almost 20,000 people had been killed and the country’s autocratic monarchy had been dismantled. In its place a new democratic system was established. But from the brutality of war a massive human trafficking industry had also emerged. It took advantage of systemic poverty and government corruption to gain international reach in just a few years. It soon infected a vast number of industries. One of the most heavily affected was tourism, where wealthy foreigners are manipulated into volunteering at orphanages. They willingly pay large sums of money to an agency in order to stay for weeks or months at an orphanage under the impression they are making a significant difference to the lives of the children. And when they go home and post pictures on social media and tell friends about how they helped orphans on the other side of the world, they do so while oblivious to their own complicity in trafficking. “They get foreigners to come over, hang out for a week or two with children, they give a lot of money, they think the kids are cute. Maybe they are malnourished as well so the volunteer thinks they need more money and so they go back to Australia or the States and they may raise more money and send it over,” said Rosefield. “Pretty soon the children have become a commodity, you have to have them in order for these orphanages to run, and soon there’s a cycle. Once the kids are old and not cute, they’re gone and new ones are found. They also think it makes sense to keep them under-fed to make them look unhealthy,” Rosefield explained. Almost ten years after the end of the war, in 2014, the U.S. State Department found that Nepal still did not comply with the minimum standards required for the elimination of trafficking but noted it had begun to implement changes. That same year, the Nepalese government’s Central Child Welfare Board found that 90 percent of the orphanages in Nepal failed to meet the government’s basic requirements to operate and the majority of the children had living parents. Meanwhile, organizations like Umbrella and Next Generation Nepal had begun efforts to rescue children found in orphanages and reintegrate them with their families with an incredible success rate. Working with local authorities, their staff were travelling all over the mountainous terrain to locate, reunite and educate families. These small signs of progress against human trafficking were however, quickly put to an end. The UN Children’s Fund (UNICEF) said the earthquake, as well as nearly 60 aftershocks that followed, caused “vast devastation across much of the country.” They added that at least 940,000 children were living in areas severely affected by the quake. UNICEF further stressed the vulnerability of children by highlighting that access to safe water and sanitation had become limited, and many children had become separated from their families. Disaster relief agencies from around the world were mobilized and sent to Nepal’s remote villages to pull people from the rubble and provide medical care and shelter. But hidden among the chaos were the traffickers. Rajan Burlakoti, a Child Protection Officer at UNICEF, said “Traffickers impersonated aid workers, they pretended they were there to support the villagers and help families overcome the trauma of the earthquake. With around two million people left huddling under tin sheets and tarpaulins waiting for help, the earthquake had created the perfect conditions for trafficking to thrive. But the issue of trafficking became a low priority compared to the massive reconstruction effort needed and it was also virtually impossible for any organization to track children that were missing due to trafficking. The destruction was so extensive that a missing child or person could have been buried under rubble, never to be found. Furthermore, Nepal does not have a reliable system of birth registration making it almost impossible to know how many children were expected to be in the country at any one time. “The information we have from Nepal police reports suggest that the number of missing children immediately, and in the months following the earthquake, increased significantly,” said Burlakoti. “Of course this could have two interpretations. One is that because of the earthquake they were buried somewhere and no one was able to recover their bodies so they’d been reported missing, or they had been trafficked, taken outside of the country by someone and we don’t know about their whereabouts. “If the first is the case and they were genuinely missing because they were buried or they were trapped somewhere and no one was able to find their body then we cannot say that it was a case of trafficking. But if we connect the dots, then we find that many more children were being found in India,” Burlakoti explained. “We also know there were increased attempts at trafficking because more women and children were found trying to cross the border without any documentation and without knowing where they were going. The chaos in Nepal immediately after the quake meant that trafficking people inside the country was difficult. But trafficking outside of Nepal had been a side to the industry that had been growing for a number of years. The purpose is usually to sell people as labor to countries in the Middle East and East Asia, but there have been reports of victims being found in developed countries, such as the United Kingdom. To combat this Nepal’s government had banned people from travelling to many of those countries for domestic work. But traffickers circumvent this via the open border with India, which allows Nepalese and Indian nationals to move freely across the border without passports or visas. They may live and work in either country. India is then used as a jumping off point for sending trafficked people further afield. In some cases, Nepalese adults will pay to be smuggled to India and then on to the Middle East because they have been promised profitable work. But often this evolves into a case of trafficking when then they reach their destination and find themselves exploited and their passports taken. In the aftermath of the earthquake international donors pledged $4.1 billion to help rebuild the Himalayan nation but little has changed in two years. Political controversy created by the government’s new constitution, which was passed at the end of 2015, sparked protests across the country and resulted in a temporary halt on imports from India, further crippling the country’s economy. Many who were left homeless after the quake have stayed that way and today they still live outside or in hastily built shelters, exposed to the freezing winters and violent monsoons. Any education their children may have been receiving before the quake is also likely to be gone, with their schools reduced to piles of rubble along with their homes. The survivors face severe economic instability, extreme poverty, and hunger so when a stranger visits promising to provide for their child and leave a family with one less mouth to feed, the offer is all the more tempting. The aftermath and repercussions are comparable only to the civil war and just as it did then, trafficking is escalating. Groups like UNICEF are rapidly trying to counter the escalation of trafficking through intervention and rescue operations, and through awareness campaigns that inform families about how the industry works, and the importance of not handing over their children. They are also working with the government to include trafficking awareness in children’s school education. But this kind of support will never be able to fully stamp out the problem, especially when the damage left by the earthquake still exists and so many families remain hungry and homeless. The earthquake has also attracted a greater number of travelers who are keen to do some good and for many that means volunteering at orphanages. This highlights a vital need for awareness among younger people in developed countries who are largely unaware the trafficking industry even exists. “The problem is not just the voluntourism in illegal or unregistered orphanages,” said Burlakoti. “But also in the registered orphanages because by principle they are meant to provide services for the children who do not have parents or do not have a family. By keeping children who have a family and by not trying to reintegrate them to the respective family or find family-based alternative care, they are undermining the best interests of the child. The human trafficking industry affects children and adults alike in Nepal and it is vital that the government takes steps to eliminate it. On the international side this could be ratifying important UN policies that help to fight trafficking, such as the 1993 Hague Convention on the Protection of Children in Need, the 1996 Child Protection Convention, and the UN Trafficking Protocol. But the most important step domestically, according to Burlakoti, is to assess what created the industry in the first place. “We use the analogy of fever,” he said. “Our bodies may have a fever because of some internal infection, we may have fever because our body is fighting against a problem somewhere, and that is like trafficking in Nepal. “If we use paracetamol to counter it, we are only controlling the fever, think of this as trafficking interventions or rescues. The root infection is somewhere else,” Burlakoti said.